See Calculation of control flow successors. Definition at line 269 of file Trace.h. Starts at zero for each label. Definition at line 270 of file Trace.h. Referenced by Sawyer::Container::Trace< T, IndexTag >::dump(), and Sawyer::Container::Trace< T, IndexTag >::traverse(). Definition at line 271 of file Trace.h. 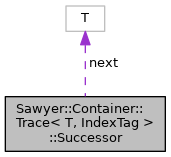 Referenced by Sawyer::Container::Trace< T, IndexTag >::dump(), Sawyer::Container::Trace< T, IndexTag >::successorSet(), and Sawyer::Container::Trace< T, IndexTag >::traverse().